When Dead Letter Circus blasted onto Australian airwaves in 2007, their bombastic yet nuanced take on alternative rock left most observers struggling to process what they were hearing. It was epic, it oozed confidence, it was intense and open all at once. It was the debut of a sound so fresh and unique that it was hard to classify. Their self-titled EP launched a wild ride of sold out shows, massive radio airplay, festival sing-a-longs, and international airports via US major label interest. Barely a moment was spent at their Brisbane home as the band criss-crossed the country satiating hard-core fans and building an ever-growing army of DLC disciples. Everywhere the band went, that army sang every word of the EP back, loud and clear – it was music that clearly resonated with many, capturing an angst of the everyday and an emotional link to the yearning for a freedom unknown. Completely independently, the band shifted well over 13,000 units of the debut EP and subsequent double A side single ‘Next in Line / Reaction’. Triple J radio placed everything that the band released on high rotation. Live, the band were festival favourites, with the choir of voices roaring both approval and vocalist Kim Benzie’s lyrics with the passion of a frantic soccer crowd. Word spread – the EP was released in Japan, and the band was flown to LA to sample the catering and perform a string of label showcases. Yet the question on every fan and media onlooker’s lips was – when would the debut album be released? And how do you follow up something as mesmerising and universally acclaimed as their initial forays? The band were well aware of the standards they had set for themselves, but had an unwavering confidence in the creative process that had given life to their EP and follow up single. They did what they had always done. The four members looked inwardly, critically, at every element of every song written in the run to the album, and took an uncompromising stance when it came to writing,re-imagining, refining and ultimately recording their debut, ‘This is the Warning’. They also brought in the producer who had been onboard since the first EP – Forrester Savell, who is thought of as an honorary fifth member of the band for his significant contribution in weaving the elements together, providing song-writing input, and adding a touch of “special sauce”. Expectations were high – Savell’s last two projects had been certified Gold (The Butterfly Effect, Karnivool), and after a lengthy pre-production, writing and re-writing phase, he brought the band to Melbourne’s famous Sing Sing Studios to track ‘This is the Warning’. Set up in four separate working environments within the Sing Sing complex, each member of the band worked tirelessly over their individual parts and contributions, conducted by maestro Savell, in a unique and ultimately successful experiment in sonic creation. The process was intense to say the least. Over an incredible 18 month gestation period, with every deadline pushed, every note analysed, every resource pooled, and every avenue of exploration exhausted, ‘This Is The Warning’ was injected a transfusion of every ounce of available energy that the band possessed. The sound of Dead Letter Circus on This is the Warning is more than just a singular representation – rather, it is the redefining of how adrenaline and emotion can be blended seamlessly into works of sonic art; of how soaring melodic adventures can be let fly above a mountain range of raw but somehow channeled rhythmic power. In short, it rocks. But it also catches the light of your reflection and beckons you to look inside yourself. It’s music that lures you towards your speakers, then seizes you by the throat. It’s love, loss, betrayal, humanity, societal norms, questioning, and the search for meaning. And it’s unlike anything you’ve ever heard. Album opener ‘Here We Divide’ is undulating, ignited by a shimmering riff from Maric and a wall of clinically precise work from the rhythm section, with Benzie’s lyrics screaming forth, at once rapid fire and soaring. ‘One Step’ is a monster of a song; “If ever a song wrote itself, ‘One Step‘ is that song for us” remarks Benzie. It’s a stadium filling track that has an undeniable, incendiary movement, that carries you to an outro waiting to deliver the first sensation of the hair standing on the back of your neck as Benzie cries “Just can’t find a way”, and we’re only 8 minutes in. away again, leaving the stark questions “Do you feel anything inside anymore? How far will you go?” hanging hauntingly. ‘This Long Hour‘ is a departure from most previous Dead Letter Circus releases, pulling down the tempo and allowing space to engulf the listener. It delves deep, and if you let the track immerse you, it’s a striking, powerful place with an electronic current that drags you over the falls as the chorus hits. The slink of ‘Cage’ catches you unawares, with a dark ebb and flow and a melodic hook that seems to creep in and out of the shadows, building uniquely from an electronic pulse to a full-blown rock resolution, Mezzanine-era Massive Attack on steroids. ‘The Drum’ is an atmospheric and electronic bed for Benzie’s philosophical take on the everyday. “In day to day life I believe I can’t feel anything, like I’m numb. But ‘The Drum’ finds in the dissatisfaction there’s a glimmer or a spark that brings you back to the side of hope.” And as Benzie beckons to “help me change my ways” the band obliges with a frenetic, layered and progressive closing that takes the intensity to a dark new level. ‘The Design‘ has a different feel again, almost swinging into life, with a tenderness that is new and intoxicating. “Even just playing it live feels vulnerable and it really shows another side of the band” says Hill. ‘Next in Line’ is a thunderous tune that cranks up the tempo and delivers serious energy, with Williams’ furious drumming flowing into ‘Walk’, which is a beautifully balanced blend of power and subtlety. Benzie likens the song to “the feeling of the axe falling when you make a snap decision if something’s not working. You can’t take that back. So sometimes you have to make it work, not just walk away. It’s not perfect, but that’s OK.” ‘Walk’ scales toward a crescendo that seems to make you hold your breath until the final note rings out. The title track, ‘This is the Warning’, aims to shake the sleeping masses awake with a resonant call “not to ignore the feeling in your chest that something’s not right, and there’s more to the truth than what we’re being told” explains Benzie. A massive percussion section generates a huge impact as the vocalist cries “we’re running out of time.” And after an intense hour of listening, it’s time to take that breath. What are Dead Letter Circus fans going to think of This is the Warning? Maric pauses for a moment. “For some it will be a challenging first listen. For others it will click immediately. We’ve come a long way since our inception and we’re reaching a point of our growth as artists where we are not afraid to open doors that were once closed. True art comes from taking risks and that’s what we’ve done with this album. At the end of the day we write music that we love and that is the only formula we adhere to. If it doesn’t give us goose bumps, then it’s not worth our time and certainly not something we would want to release to our fans.”’ “A DLC fan that hears this album will find all the songs are from a first person basis” comments Benzie. “A person in a world, talking to a friend, struggling to describe something in a place were words don’t seem adequate, so sounds are the things that make sense. I hope they feel that where EP tracks like ‘Lines’ and ‘Alien’ finish, that’s where this album begins and expands.” “Yeah. The album is definitely a new beginning,” agrees Hill. And after joining some elite company with ‘This is the Warning’ landing at Number 2 on the album charts, you get the impression that the band themselves are also at the beginning of a whole new chapter. 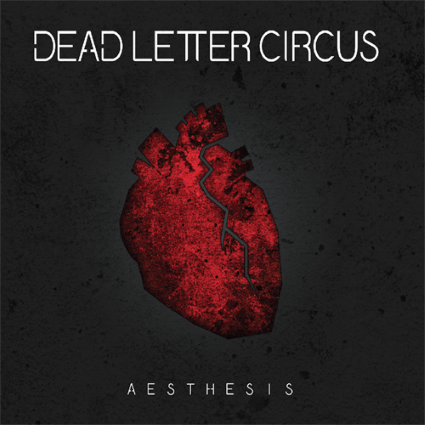 Album Review: Dead Letter Circus - "Aesthesis"